This article applies to: AOMEI Backupper v1.6 and later versions. 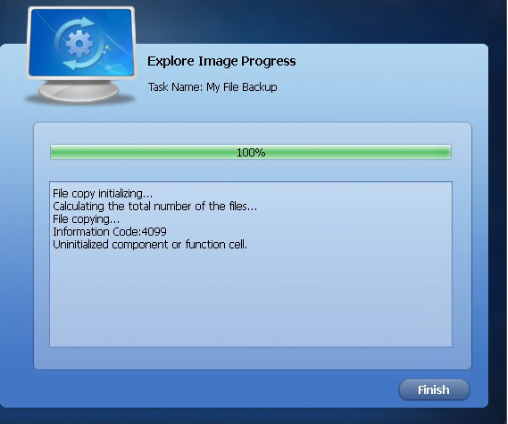 In a few cases, when you choose to do a backup of any kind or check image , you may encounter Information Code 4098: Invalid parameter or Information Code 4099: Uninitialized component or function cell. 1. If a programming error occurs in the software, you might encounter error 4098 or 4099, please re-run our program and back up one more time. 2. Sometimes, the system backup might need to reboot to complete backup, but the program can’t find the “system” partition or “boot” partition after reboot. So you might encountered the error 4098. You can exit the reboot mode and then retry operation. Or, you can create winpe bootable media of AOMEI Backupper and then boot from the winpe to do backup. 3. 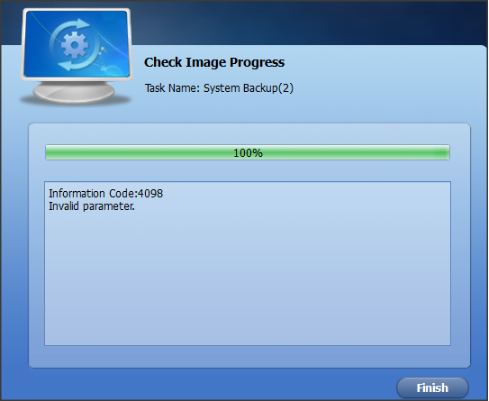 If the error still appear, please reinstall the software and try again.